b. (French) Girard P & Gomez P (2009), Lacs des Pyrénées: Andorre. "Andorra en xifres 2007: Situació geogràfica, Departament d'Estadística, Govern d'Andorra" (PDF). http://www.estadistica.ad/serveiestudis/publicacions/CD/Anuari/cat/pdf/xifres.PDF. Retrieved 26 August 2012.
c. "Informe sobre l'estat de la pobresa i la desigualtat al Principal d'Andorra (2003)". Estadistica.ad. http://www.estadistica.ad/serveiestudis/publicacions/Publicacions/Pobresa.pdf. Retrieved 25 November 2012. Andorra ( /ænˈdɔ:rə/; Catalan: [ənˈdorə], locally: [anˈdɔra]), officially the Principality of Andorra (Catalan: Principat d'Andorra), also called the Principality of the Valleys of Andorra (Catalan: Principat de les Valls d'Andorra), is a sovereign landlocked microstate in Southwestern Europe, located in the eastern Pyrenees mountains and bordered by Spain and France. Created under a charter in 988, the present principality was formed in 1278. It is known as a principality as it is a monarchy headed by two Co-Princes – the Roman Catholic Bishop of Urgell in Spain, and the President of France. The origin of the word Andorra is unknown, although several hypotheses have been formulated. The oldest derivation of the word Andorra is from the Greek historian Polybius (The Histories III, 35, 1) who describes the Andosins, an Iberian Pre-Roman tribe, as historically located in the valleys of Andorra and facing the Carthaginian army in its passage through the Pyrenees during the Punic Wars. The word Andosini or Andosins (Ἀνδοσίνους) may derive from the Basque handia whose meaning is "big" or "giant". 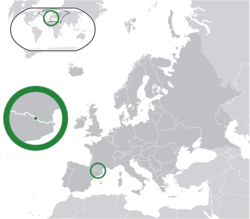 The Andorran toponymy shows evidence of Basque language in the area. Another theory suggests that the word Andorra may derive from the old word Anorra that contains the Basque word ur (water). Another theory suggests that Andorra may derive from Arabic al-durra, meaning "The pearl" (الدرة). When the Moors invaded the Iberian Peninsula, the valleys of the Pyrenees were covered by large tracts of forest, and other regions and towns, also dominated by Muslims, received this designation. In the 13th century, a dispute arose between the Bishop of Urgell and the Count of Foix. The conflict was resolved in 1278 with the mediation of Aragon by the signing of the first paréage which provided that Andorra's sovereignty be shared between the count of Foix (whose title would ultimately transfer to the French head of state) and the Bishop of Urgell, in Catalonia. This gave the principality its territory and political form. With the passage of time, the co-title to Andorra passed to the kings of Navarre. After Henry of Navarre became King Henry IV of France, he issued an edict in 1607, that established the head of the French state and the Bishop of Urgell as Co-Princes of Andorra. In 1812–13, the First French Empire annexed Catalonia and divided it in four départements, with Andorra being made part of the district of Puigcerdà (département of Sègre). Andorra is a parliamentary co-principality with the President of France and the Bishop of Urgell (Catalonia, Spain) as Co-Princes. This peculiarity makes the President of France, in his capacity as Prince of Andorra, an elected reigning monarch, although he is not elected by a popular vote of the Andorran people. The politics of Andorra take place in a framework of a parliamentary representative democracy, whereby the Head of Government is the chief executive, and of a pluriform multi-party system. In the modern era, the army has consisted of a very small body of volunteers willing to undertake ceremonial duties. Uniforms were handed down from generation to generation within families and communities. Today a small, twelve-man ceremonial unit remains the only permanent section of the Andorran Army, but all able-bodied men remain technically available for military service, with a requirement for each family to have access to a firearm. The army has not fought for more than 700 years, and its main responsibility is to present the flag of Andorra at official ceremonial functions. According to Marc Forné Molné, Andorra's military budget is strictly from voluntary donations, and the availability of full-time volunteers. One of the main sources of income in Andorra is tourism from ski resorts which total over 175 km (109 mi) of ski ground. The sport brings in over 7 million visitors and an estimated 340 million euros per year, sustaining 2000 direct and 10000 indirect jobs at present. The geographical complexity of the country as well as the small number of students prevents the University of Andorra from developing a full academic programme, and it serves principally as a centre for virtual studies, connected to Spanish and French universities. The Virtual Studies Centre (Centre d’Estudis Virtuals) at the University runs approximately twenty different academic degrees at both undergraduate and postgraduate levels in fields including tourism, law, Catalan philology, humanities, psychology, political sciences, audiovisual communication, telecommunications engineering, and East Asia studies. The Centre also runs various postgraduate programmes and continuing-education courses for professionals. Healthcare in Andorra is provided to all employed persons and their families by the government-run social security system, Caixa Andorrana de Seguretat Social (CASS), which is funded by employer and employee contributions in respect of salaries. The cost of healthcare is covered by CASS at rates of 75% for out-patient expenses such as medicines and hospital visits, 90% for hospitalisation, and 100% for work-related accidents. The remainder of the costs may be covered by private health insurance. Other residents and tourists require full private health insurance. There are no airports for fixed-wing aircraft within Andorra's borders but there are, however, heliports in La Massana (Camí Heliport), Arinsal and Escaldes-Engordany with commercial helicopter services and an airport located in the neighbouring Spanish comarca of Alt Urgell, 12 kilometres (7.5 miles) south of the Andorran-Spanish border. Since July 2015, Andorra–La Seu d'Urgell Airport has operated commercial flights to Madrid and Palma de Mallorca, and is the main hub for Air Andorra and Andorra Airlines. Nearby airports located in Spain and France provide access to international flights for the principality. The nearest airports are at Perpignan, France (156 km from Andorra) and Lleida, Spain (160 km from Andorra). The largest nearby airports are at Toulouse, France (165 km from Andorra) and Barcelona, Spain (215 km from Andorra). There are hourly bus services from both Barcelona and Toulouse airports to Andorra. In Andorra, mobile and fixed telephone and internet services are operated exclusively by the Andorran national telecommunications company, SOM, also known as Andorra Telecom (STA). The same company also manages the technical infrastructure for national broadcasting of digital television and radio. There is only one Andorran television station, Ràdio i Televisió d'Andorra (RTVA). Radio Nacional d’Andorra operates two radio stations, Radio Andorra and Andorra Música. There are three national newspapers, Diari d'Andorra, El Periòdic d'Andorra, and Bondia as well as several local newspapers. There is also an amateur radio society. Additional TV and radio stations from Spain and France are available via digital terrestrial television and IPTV. Other sports practised in Andorra include cycling, volleyball, judo, Australian Rules football, handball, swimming, gymnastics, tennis and motorsports. In 2012, Andorra raised its first national cricket team and played a home match against the Dutch Fellowship of Fairly Odd Places Cricket Club, the first match played in the history of Andorra at an altitude of 1,300 meters (4,300 ft). As part of the Catalan cultural ambit, Andorra is home to a team of castellers, or Catalan human tower builders. The Castellers d'Andorra, based in the town of Santa Coloma d'Andorra, are recognized by the Coordinadora de Colles Castelleres de Catalunya, the governing body of castells. Ariadna Tudel Cuberes and Sophie Dusautoir Bertrand earned the bronze medal in the women's team competition at the 2009 European Championship of Ski Mountaineering. Joan Verdu Sanchez earned a bronze medal in Alpine Skiing at the 2012 Winter Youth Olympics. In 2015, Marc Oliveras earned a silver medal in Alpine Skiing at the 2015 Winter Universiade, while Carmina Pallas earned a silver and a bronze medal in the same competition. ^ a b c d e f g "CIA World Factbook entry: Andorra". Cia.gov. https://www.cia.gov/library/publications/the-world-factbook/geos/an.html. Retrieved 26 August 2012. ^ "Andorra 2008, Departament d'estadística d'Andorra". Estadistica.ad. http://www.estadistica.ad/serveiestudis/web/banc_dades4.asp?lang=1&codi_tema=3&codi_divisio=1098&codi_subtemes=155. Retrieved 26 August 2012. ^ "HUMAN DEVELOPMENT REPORT 2015 - Statistical annex". United Nations. 2015. http://hdr.undp.org/sites/default/files/hdr_2015_statistical_annex.pdf. Retrieved 14 December 2015. ^ "Maps, Weather, and Airports for Andorra la Vella, Andorra". Fallingrain.com. http://www.fallingrain.com/world/AN/0/Andorra_la_Vella.html. Retrieved 26 August 2012. ^ "Background Note: Andorra". State.gov. http://www.state.gov/r/pa/ei/bgn/3164.htm. Retrieved 2015-05-14. ^ a b "HOTELERIA I TURISME". http://www.estadistica.ad/serveiestudis/web/exportar_banc_dades_csv.asp?formules=anualinici&any1=01/01/2008&any2=01/01/2008&codi_divisio=380&lang=1&codi_subtemes=59&codi_tema=10. Retrieved 14 May 2015. ^ "United Nations Member States". Un.org. http://www.un.org/en/members/. Retrieved 2015-05-14. ^ Gautam, Naik (18 December 2014). "Global Life Expectancy Increases by About Six Years". The Wall Street Journal. http://www.wsj.com/articles/global-life-expectancy-increases-by-about-six-years-1418861100. Retrieved 25 December 2014. ^ Font Rius, José María (1985). Estudis sobre els drets i institucions locals en la Catalunya medieval. Edicions Universitat Barcelona. p. 743. ISBN 8475281745. https://books.google.com/books?id=JQL6rtB8VtQC&pg=PA743&dq=Anorra+andorra&hl=ca&sa=X&ei=DcwZT6_ALYzs-gaKmt3OCg&ved=0CFAQ6AEwAw#v=onepage&q=Anorra%20andorra&f=false. ^ "Online Etymology Dictionary". Etymonline.com. http://www.etymonline.com/index.php?term=Andorra. Retrieved 2015-05-14. ^ a b c "Elements de la història del Principat d'Andorra" (in Catalan). Archived from the original on 9 February 2010. http://www.coprince-fr.ad/catala/elements.htm. ^ a b "World War I Ends in Andorra". New York Times: p. 66. 25 September 1958. http://query.nytimes.com/gst/abstract.html?res=9D06E6DF1530E73BBC4D51DFBF668383649EDE. ^ "Documento BOE-A-1993-16868". BOE.es. 30 June 1993. http://www.boe.es/buscar/doc.php?id=BOE-A-1993-16868. Retrieved 26 August 2012. ^ "El Sometent | Tourism". Turisme.andorralavella.ad. 17 May 2011. http://turisme.andorralavella.ad/?q=en/node/281. Retrieved 26 August 2012. ^ a b "Decret veguers Sometent, del 23 d'octubre de 1984" (PDF). http://recarrega.net/arxius/Decret%20veguers%20Sometent,%20del%2023%20d%27octubre%20de%201984.pdf. Retrieved 26 August 2012. ^ Reich, Herb (2012). Lies They Teach in School: Exposing the Myths Behind 250 Commonly Believed Fallacies. New York: Skyhorse Publishing, Inc.. p. 52. ISBN 9781620873458. https://books.google.ca/books?id=NsI_ub0Vh7EC. ^ Ben Cahoon. "Andorra". Worldstatesmen.org. http://www.worldstatesmen.org/Andorra.html. ^ "Andorra's 'ARMY' – Eleven Permanent Troops!". The Times. 5 January 1934. http://trove.nla.gov.au/ndp/del/article/1157484. ^ "Andorra". State.gov. 20 April 2012. http://www.state.gov/r/pa/ei/bgn/3164.htm. ^ "History of the Principality of Andorra". Andorramania.com. 11 December 1997. http://www.andorramania.com/histoire_gb.htm. ^ "Andorra". Un.org. 25 September 2003. http://www.un.org/webcast/ga/58/statements/andoeng030925.htm. ^ "Andorra". State.gov. 2013-09-13. http://www.state.gov/r/pa/ei/bgn/3164.htm. ^ "Andorra Politics, government, and taxation, Information about Politics, government, and taxation in Andorra". Nationsencyclopedia.com. http://www.nationsencyclopedia.com/economies/Europe/Andorra-POLITICS-GOVERNMENT-AND-TAXATION.html. ^ Carles Iglesias Carril. "Andorran Police Service website". Policia.ad. http://www.policia.ad/. Retrieved 26 August 2012. ^ Carles Iglesias Carril. "Cos de Policia - Estructura organitzativa". Policia.ad. http://www.policia.ad/estructura.html. Retrieved 2015-05-14. ^ "Vehicle details with extensive photo gallery here". Bombers.ad. http://www.bombers.ad/index.php?option=com_content&view=article&id=80&Itemid=64. Retrieved 26 August 2012. ^ "Fire Brigade history here (in Catalan)". Bombers.ad. http://www.bombers.ad/index.php?option=com_content&view=article&id=83&Itemid=44. Retrieved 26 August 2012. ^ "Andorran Fire Service site". Bombers.ad. 17 August 2012. http://www.bombers.ad. Retrieved 26 August 2012. ^ a b "Andorra and its financial system 2013" (PDF). Aba.ad. http://www.aba.ad/pub/publicaciones/financial_system_2013.pdf. Retrieved 14 May 2015. ^ "List of Banks in Andorra". Thebanks.eu. http://thebanks.eu/banks-by-country/Andorra. Retrieved 2015-05-14. ^ "CIA World Factbook: Andorra". https://www.cia.gov/library/publications/the-world-factbook/rankorder/2129rank.html. Retrieved 5 June 2013. ^ "Andorra gets a taste of taxation". The guardian. 27 December 2011. http://www.guardian.co.uk/world/2011/dec/27/andorra-financial-crisis-tax. Retrieved 30 March 2013. ^ "Andorra Unveils First Indirect Tax Revenue Figures". Tax News. 9 May 2013. http://www.tax-news.com/news/Andorra_Unveils_First_Indirect_Tax_Revenue_Figures____60703.html. ^ "Andorra to introduce income tax for first time". BBC News. 2 June 2013. http://www.bbc.co.uk/news/business-22745895. ^ "Andorre aligne progressivement sa fiscalité sur les standards internationaux (Elysée)". Notre Temps. 31 May 2011. http://www.notretemps.com/argent/andorre-aligne-progressivement-sa,i29431. ^ "El Parlamento andorrano facilita a los hijos de los residentes la adquisición de la nacionalidad | Edición impresa | EL PAÍS". Elpais.com. http://www.elpais.com/articulo/internacional/ANDORRA/Parlamento/andorrano/facilita/hijos/residentes/adquisicion/nacionalidad/elpepiint/19850801elpepiint_23/Tes/. Retrieved 2015-05-14. ^ "Un examen para ser andorrano | Edición impresa | EL PAÍS". Elpais.com. 1985-10-27. http://www.elpais.com/articulo/internacional/ANDORRA/examen/ser/andorrano/elpepiint/19851027elpepiint_18/Tes/. Retrieved 2015-05-14. ^ "La Constitución de Andorra seguirá limitando los derechos del 70% de la población | Edición impresa | EL PAÍS". Elpais.com. 1992-05-09. http://www.elpais.com/articulo/internacional/RIBAS/_oSCAR/MARTi_ALANiS/_JOAN_/ARZOBISPO_DE_URGELL/ANDORRA/Constitucion/Andorra/seguira/limitando/derechos/poblacion/elpepiint/19920509elpepiint_5/Tes/. Retrieved 2015-05-14. ^ "Andorra, sólo inmigrantes sanos | Edición impresa | EL PAÍS". Elpais.com. 2006-07-14. http://www.elpais.com/articulo/sociedad/Andorra/solo/inmigrantes/sanos/elpporint/20060714elpepisoc_8/Tes/. Retrieved 2015-05-14. ^ "Framework Convention for the Protection of National Minorities (FCNM) : National Minorities, ''Council of Europe'', 14 September 2010". Coe.int. http://www.coe.int/t/dghl/monitoring/minorities/default_en.asp. Retrieved 26 August 2012. ^ "Framework Convention for the Protection of National Minorities CETS No. 157". Conventions.coe.int. http://conventions.coe.int/Treaty/Commun/ChercheSig.asp?NT=157&CM=&DF=&CL=ENG. Retrieved 25 November 2012. ^ "Observatori de l'Institut d'Estudis Andorrans" (in Catalan). http://www.iea.ad/cres/observatori/temes/llengua3trimestre2005.htm. Retrieved 5 June 2013. ^ "Andorra". 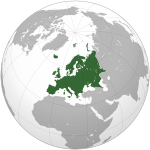 International - Regions - Southern Europe. The Association of Religion Data Archives. 2005. http://www.thearda.com/internationalData/countries/Country_6_2.asp. Retrieved 4 July 2009. ^ "Andorra: population, capital, cities, GDP, map, flag, currency, languages, ...". Wolfram Alpha. Online. Wolfram – Alpha (curated data). 13 March 2010. http://www.wolframalpha.com/entities/countries/andorra/xy/p0/k6/. ^ "US Dept of State information". State.gov. 8 November 2005. http://www.state.gov/g/drl/rls/irf/2005/51537.htm. Retrieved 9 August 2013. ^ a b "List of specialties with coverage by CASS at the Hospital Nostra Senyora de Meritxell (2009)". Online.cass.ad. http://online.cass.ad/web/lacass/professionalSalut/hospitals/Andorra. Retrieved 26 August 2012. ^ "Agència de Mobilitat, Govern d'Andorra". Mobilitat.ad. http://www.mobilitat.ad/CA/default.asp. ^ "Inici - Heliand - Helicopters a Andorra". Heliand. http://www.heliand.com/. Retrieved 2015-05-14. ^  Archived July 15, 2009 at the Wayback Machine. ^ "Public and regional airport of Andorra-la Seu d’Urgell". http://web.gencat.cat/en/actualitat/detall/Aeroport-public-i-comercial-dAndorra-la-Seu-dUrgell-00002. ^ "Sncf Map" (in de). Bueker.net. http://www.bueker.net/trainspotting/map.php?file=maps/french-network/french-network.gif. Retrieved 26 August 2012. ^ "Google map". Maplandia.com. http://www.maplandia.com/france/languedoc-roussillon/pyrenees-orientales/prades/latour-de-carol/. Retrieved 26 August 2012. ^ "How to travel by train from London to Andorra". http://www.seat61.com/Andorra.htm. ^ "FIFA Rankings – Andorra". Fifa.com. http://www.fifa.com/associations/association=and/ranking/gender=m/index.html. Retrieved 26 August 2012. ^  Archived May 22, 2014 at the Wayback Machine. ^ "El BC Andorra quiere volver a la Liga más bella". MARCA.com. http://www.marca.com/2012/11/13/baloncesto/basketfeb/1352828175.html. Retrieved 2015-05-14. ^ "El River Andorra regresa a la ACB 18 años después | Baloncesto | EL MUNDO". Elmundo.es. 2014-03-22. http://www.elmundo.es/deportes/2014/03/22/532e12b2e2704e1a3d8b457f.html. Retrieved 2015-05-14. ^ "Netherlands Based FFOP CC Beats Andorra National Team". Cricket World. 3 September 2012. http://www.cricketworld.com/netherlands-based-ffop-cc-beats-andorra-xi/32216.htm. Retrieved 18 December 2012. This page uses content from the English language Wikipedia. The original content was at Andorra. The list of authors can be seen in the page history. As with this Familypedia wiki, the content of Wikipedia is available under the Creative Commons License.